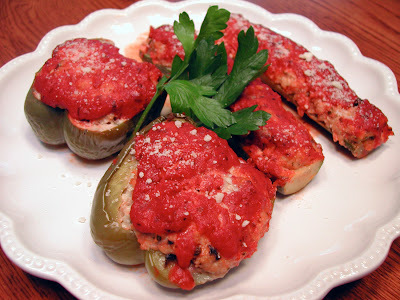 If you like meatloaf and you like stuffed peppers, than you will love this recipe. It is very different from the stuffed peppers that I was brought up eating. My mom used to make stuffed peppers with ground beef (or sometimes ground turkey), onion, garlic, rice and tomato sauce. And of course I followed suit, making them pretty much the same way. In this recipe you actually make a meatloaf filling and stuff the peppers and zucchini with it. No rice at all. It is really good. The other thing I like about this recipe is that if someone in the family doesn't like peppers, they can eat the stuffed zucchini instead. The only thing I might change the next time I make them is to lightly saute the shallots (or in the original recipe, onion) before adding it to the meat mixture. It had a little bit of a raw bite to it. But other than that, I enjoyed them thoroughly. Carefully scrape out the seeds and inner flesh from the zucchini with a melon baller or spoon, leaving 1/8-inch-thick shells, making sure not to cut through the skin. Lightly drizzle the olive oil into a 13 by 9 by 2-inch baking dish. Whisk the shallot, parsley, egg, ketchup, garlic, salt, pepper, cheese and bread crumbs in a large bowl to blend. Mix in the turkey and combine with your hands. Fill the zucchini and pepper halves with the turkey mixture, dividing equally and mounding slightly. Arrange the stuffed vegetables in the baking dish. Pour the marinara sauce over the stuffed vegetables. Bake uncovered until the vegetables are tender and beginning to brown and a thermometer inserted into the filling registers 165 degrees F, about 40-50 minutes. Transfer the stuffed vegetables to a platter and serve. That dish brings back nostalgia for me!! This is great comfort food. I always had no rice in mine growing up. ps- thanks for the tip about smart balance! 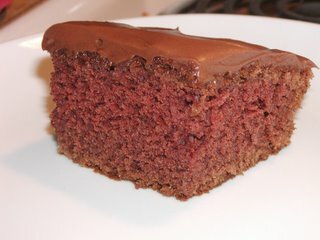 I made this recipe a while back, I remember we liked it a lot. I was so excited to see bags of peppers on clearance last week. They used to be under $1.50/bag but they were close to $4 this time (they were all the more expensive colored peppers). I passed on them since I had nothing in mind but now I wish I hadn't. You've made me hungry for stuffed peppers. I had stuffed peppers for a long period of my life I changed with grown turkey but almost the same.Zucchini is a big change and plus is very very good,thank you Annie.bambola. I love these guys plain but stuffed is even better! Oh, how I love stuffed peppers. Thanks for reminding me to make some; it's been too long! nice! i've never had a stuffed pepper with meat before. i'm making your squash lasagna tonight!